Let’s be real for a second, owning a dog is a completely amazing experience and brings us lots of Joy on a day-to-day basis. However, some of the things that go along with the dog aren’t such an amazing experience and can even throw out the look of our home. We are specifically talking about the thing that almost all dog owners have in their house, the kennel. Most people have dreamed of a remedy to the issue of an unattractive crate being in your home. However, companies have now come out with dog crate Furniture. What is this you ask? Just what it sounds like an attractive piece of furniture that goes into your home, that can also double as a crate to keep your dog in. If you’re having doubts about getting rid of your current crate then we have some great reasons that you should move on to a more fashionable choice. Well, you may want to keep your old crate for reliability purposes and if you keep your dog outside. 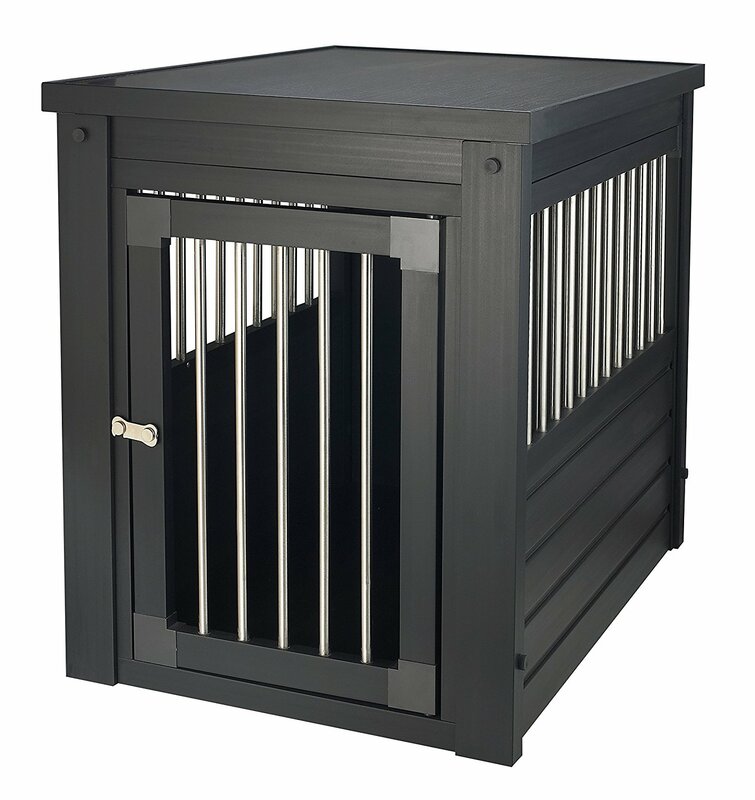 If you frequently have guests over or need to put your dog up while cleaning wouldn’t it be nice to have a more accessible crate to put them in? Even better who doesn’t love a good end table? A dog crate table is just what you’re missing to give your living room that extra piece of creativity. If you’re willing to buy a furniture dog crate, then everybody in your friend circle will be asking how you got such an interesting item. 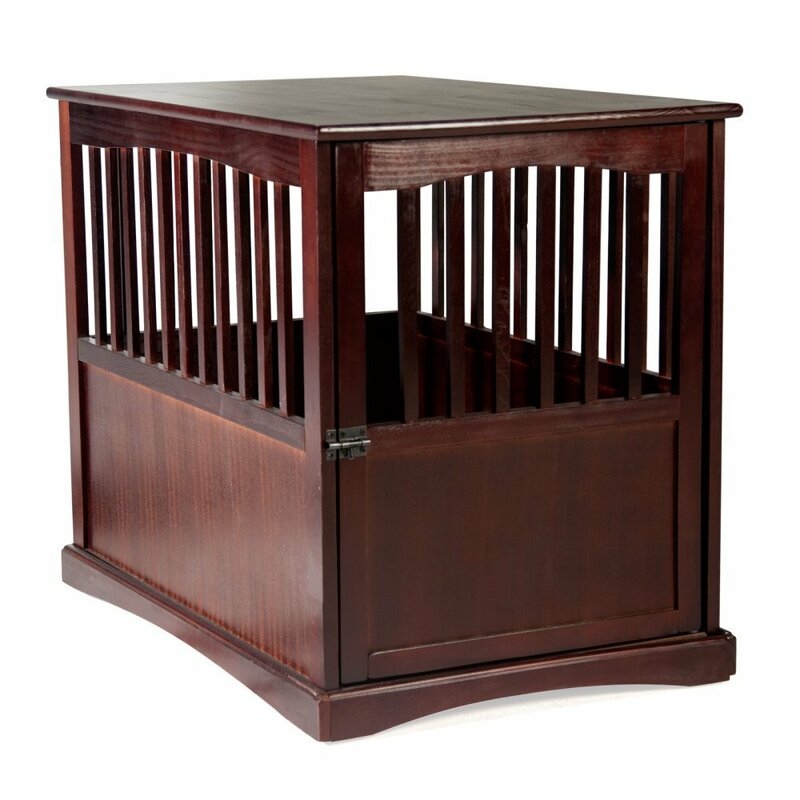 One of the major differences between normal dog crates and furniture dogs crates is that they’re made of wood. Wooden dog crates may sound like a bad idea at first, but some of them are completely sturdy and great for using while you’re away at work each day. The wooden dog crates are a lot more decorative than anything you could possibly buy at Petco. 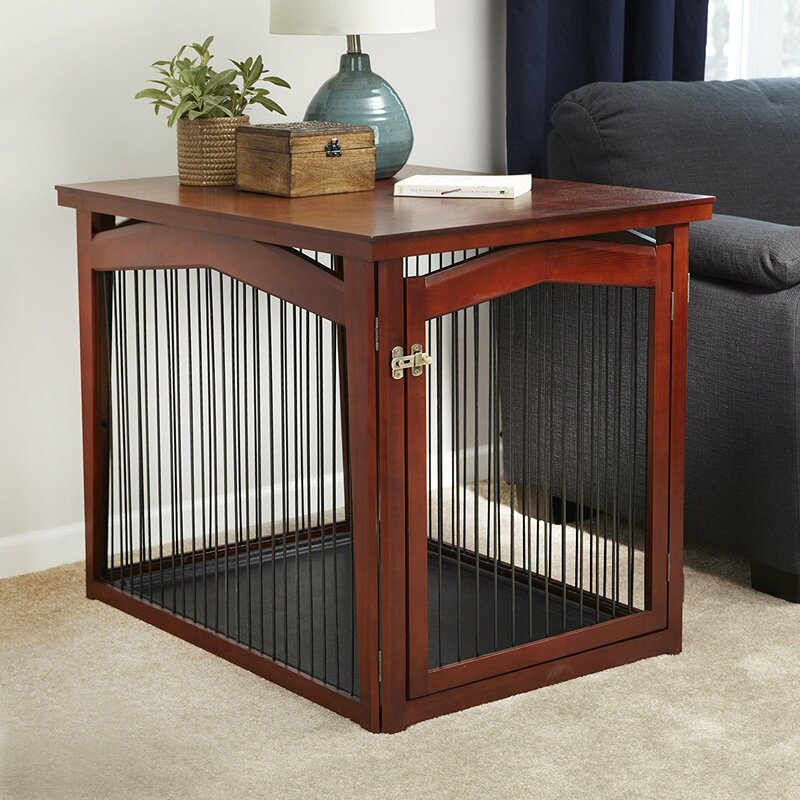 By having a decorative dog crate in your home you can forget all about having an ugly piece of metal taking up the living room. Instead, you can integrate your dog’s crate into your normal daily routine. Since these are dog crate end tables instead of just normal crates that means you can set things on top of them. Most crates are designed to be sturdy enough to set things like books and lamps on, to fit in with your normal living room decor. 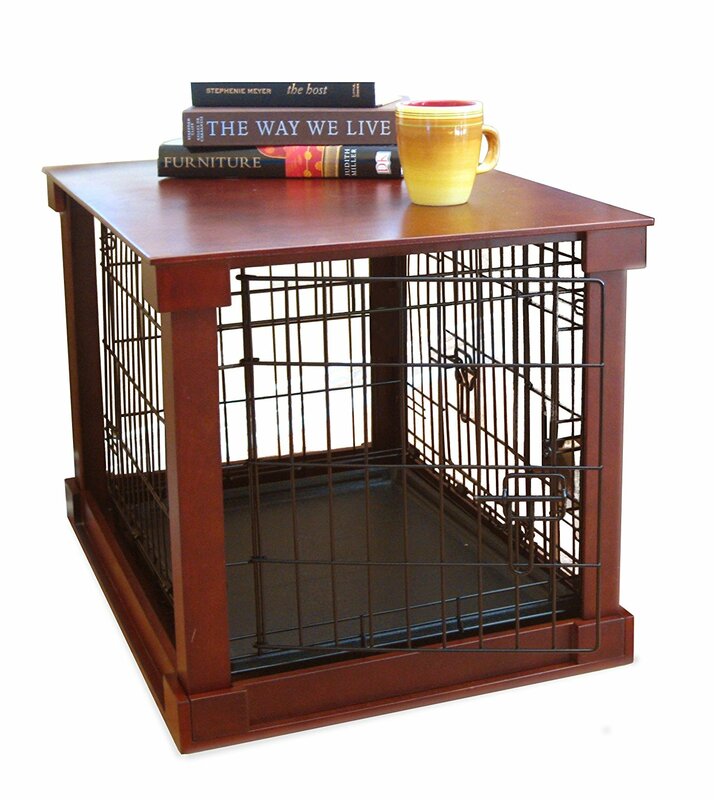 This means that you can easily put the dog crate beside your couch, and have it to set your book while you’re reading. This is a lot better than sitting it on a metal dog crate where the dog can pull the book in and chew it up. 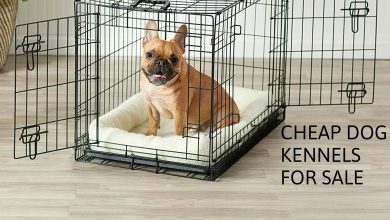 Furniture dog crates offer you also have peace of mind knowing that your dog can’t easily chew anything up you accidentally forget on top of the cage. I can’t tell you how many times I’ve heard horror stories about getting a pet getting ahold of people’s keys or pocketbooks after they accidentally left them on top of the crate. Now don’t expect these dog crates to be super cheap. 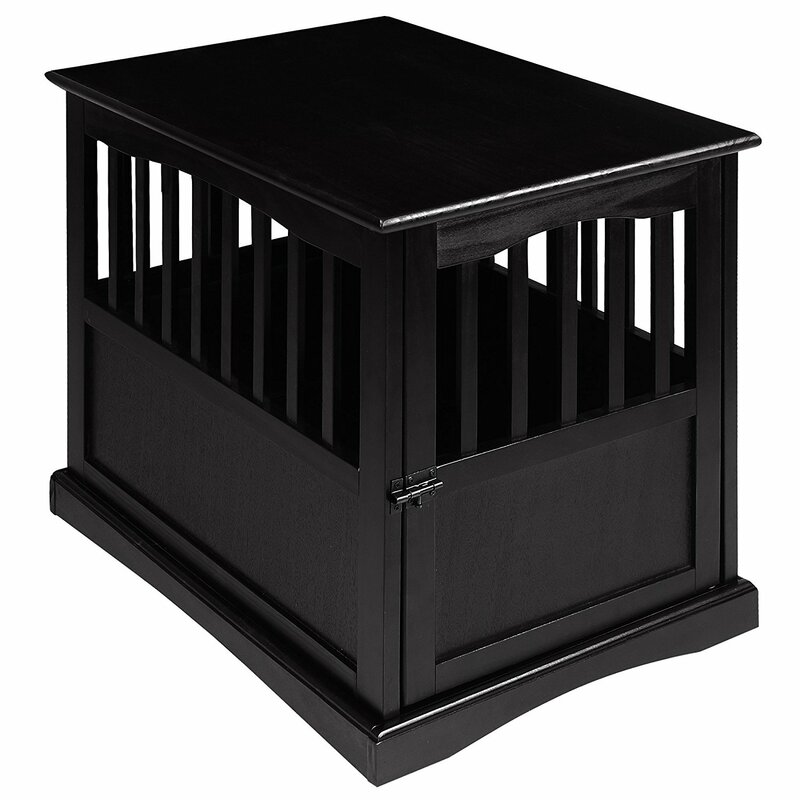 Since these are basically pet crate end tables instead of just be normal dog crates, they are going to cost you a little bit more money then you’re probably used to spending on a kennel. This is because they’re made with real wood, as well as made to be sturdy enough to handle things being set on top of them without caving in. They also have been designed by people who produced furniture for a living and all are unique ,while still being a great environment for your dog to rest. Some of these crates can even be used just as a bed. You won’t really find a wooden dog crate for much less than $100 at any given time. If you do, I would steer clear of buying the crate, it’s probably not of good quality and could endanger both you and your dog if you use it regularly. You also aren’t going to find anything in a completely wild in the color range. If you want something like black or a dark brown color then that’s easy. However, if you’re expecting something like a lilac purple or a bright blue you’re probably not going to find it unless you repaint one yourself. These are very traditional furniture pieces and aren’t going to come with anything crazy attached to them. Most of them don’t even come with ornate decorations like flowers carved into the wood.They’re designed typically to fit in with the basic color schemes that most living rooms are. Lastly, some crates aren’t meant to keep your pets in all day, but instead, are made to be dog crate beds. This means that they’re made to put your dog into rest while you’re doing activities such as cleaning. If you try to go out and leave your dog in the crate they would more than likely be able to break out of it with relative ease. These models are listed below and marked that they’re not for long-term use. Be sure to use your best judgment when you’re picking out a crate for your home, and for your specific needs. Also, note that these crates aren’t really meant for outside usage. This model is great for giving you pets lots of air and features vents on every side of the crate. The crate can contain a dog up to 80 pounds and is made for indoor use only. That being said, there are two different sizes of crates to pick from. One can fit a dog up to 45 lbs, and the other is the one that goes up to 80 lb. There are also two types of wood finishings for you to pick from to fit the decor in the room you wish to put the crate. 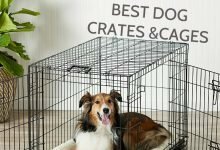 The crate features an easy hook latch to help keep your pet from escaping any time soon.On top of that, the latch is made of stainless material to keep it from rusting after years and years of use. This crate features two different price points depending on what type of finish you want it. The mahogany finish is actually a little bit more than the espresso finish, but at the price you’re already paying for the crate you won’t be able to tell much of a difference. Some really good news about this crate is that it’s completely eco-friendly. The Rubberwood that the crate is made with is actually a really environmentally friendly material. Even when Rubberwood is harvested and used up, they immediately plant another tree to replace the one they got the wood from. This dog crate is also easy to clean and has a tray you can pull out if your dog has an accident while waiting for you to get home. On top of that, the floor is made with MDF, which keeps liquids from absorbing into the wood. By having this MDF finish you can eliminate the risk of pet odors coming from your new piece of furniture. 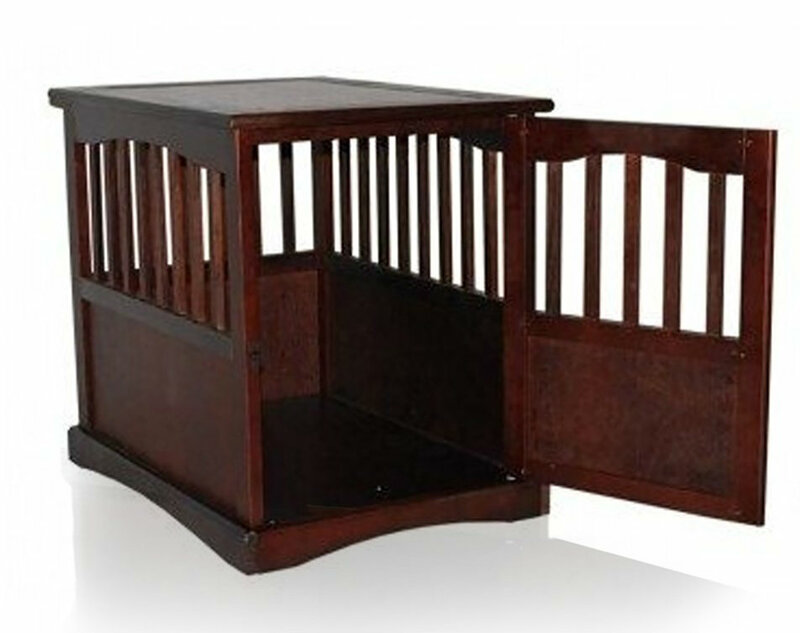 The crate can also be assembled with out the door if you would just want to have a stylish dog bed in your living room. As with everything this crate has some flaws. For starters, the door opens inward instead of outward. While they say this is to keep the door out of your way in the living space, it seems like kind of a hassle. How are you supposed to comfortably get your pet out when the door turns towards them? It’s also a little bit disappointing that they don’t have a model for a bigger dog. It seems that large sized dogs often get left out of things like this. While reviews are pretty positive, there are some stating that the doors could be easily broken if you have an over-excited pooch. There are also some reports of the packaging comes in bad, so you have to watch your product after you get it , and make sure that there weren’t any damages during shipping. Also, if your dog is a heavy chewer this may not be the best product for them. The Mary two-in-one configurable pet crate is certainly an interesting mix of innovation. 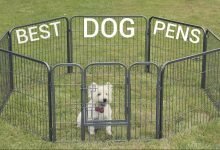 Most dog owners know that eventually, you’re going to have to get a pet gate for something or other. 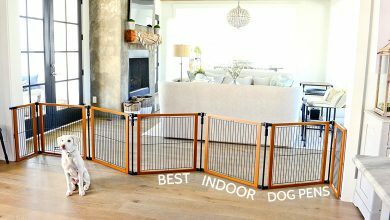 This combines the best of both worlds by giving you a stylish pet crate, and a pet gate all at the same time. The best part is that it’s going to look great in your living room beside your wooden furniture. All you have to do to switch between the two-mode is connect the pieces together to form a square, and then put the included cover on the top to make it look like the tabletop. It’s completely easy and barely any assembly is required to get the two in one crate up and running in your home. The crate also comes with a pull out plastic tray to help you with clean up during messes. On top of that, this crate cost under $100 making it a little bit more affordable for families on a budget. If that’s not enough, the gate is very, very, stylish and looks much more refined than something you would buy like a baby gate. Just based on the style of the gate model alone this crate is almost an instant sell for me. The crate does sadly only come in medium and small sizes, so big dogs are once again left out for this one. The length of the gates reach is also pretty long making it perfect for blocking off wider hallways. This coupled with the fact that this is just completely easy to assemble, and you will never need tools to put it together, makes this a perfect pick for anyone who’s not a handyman. It should be mentioned that the top of the crate is never fastened down. The included cover is actually just a piece of wood that you sit on top. There’s no way to tie it down or fasten it so that automatically holds onto the crate unless you do some engineering yourself.This means that your dog may easily be able to escape from the crate if they’re strong enough. I wouldn’t suggest going out for a long period of time and leaving your dog in this crate because of this. Even some of the weaker pooches can be pretty ingenuitive when it comes to escaping from their doggie daycare. Some people have also reported that the bars on this crate are also weak, backing up the idea that this crate shouldn’t it be used as a long-term solution during your working hours. This company really tries to push the fact that this in the table will save you space by combining a crate with a piece of furniture. The company states that objects can easily be stored on top of the crate without worrying about it giving way. 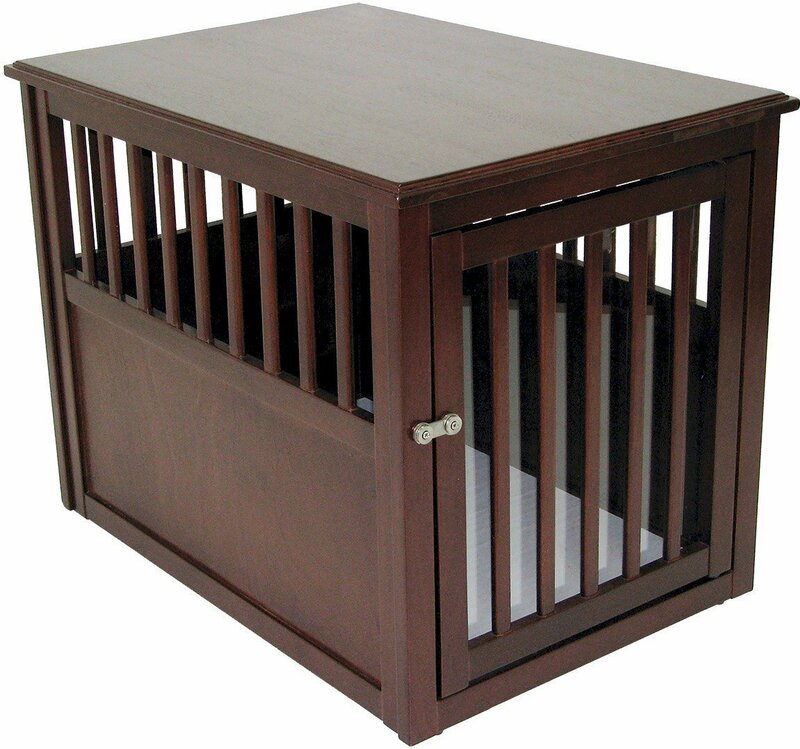 There also is a large size of this crate available that can accommodate dogs up to 88 lbs. This makes it one of the best picks on this list so far for a human to have a bigger companion in their home. The door also has a stopper on it to keep it in place when you open it. While some assembly is required everything it latches together well, meaning that you do not have to worry about your dog making any surprises escapes. That being said you should know that this crate doesn’t have any alternative colors, for you choose from, and there’s supposedly a small size for sale, but its been out of stock for quite some time on Amazon. This crate is pretty unique with the fact that it has a door stopper to keep the door in place. This means you won’t have to worry about bumping into the door, or it easily closing. Likewise, this will be a huge bonus if you have a dog that likes to wag its tail it into things. The crate also features a pullout pan, so you can easily clean out any messes that are made inside of it. On top of that, it has a stain resistant to finish, meaning that any accidents that get on the furniture itself can easily be cleaned off without worrying about some nasty aftermath. One of my favorite things about this crate is the fact that the door opens inward instead of outward. Thanks to this you don’t have to worry about your dog being crushed when you try to let them outside of the crate. Buyers have reported that the door is actually made out of softwood. This means that the door may be easy to chew through for dogs who like to nibble on things. It also isn’t the most attractive one on this list, making it a little bit unappealing because of the $300 price tag. This is not meant for long-time crating as well. The crate isn’t that strong, meaning that if you leave your dog in it while you’re working you’re liable to come home to either a messed-up crate or your dog completely free. Be sure to use this crate responsibly, and not leave your pet in it for any long amounts of time. Product dimensions: 27.5L x 20W x 24.5H in. This crate actually seems to work a little bit better as a hallway table than an end table in my opinion. It’s designed to be a little bit more rectangular than it is square. This makes it perfect for placing a little bit out of the way and throwing some decorations on top of it. It doesn’t seem like there are many different sizes of this model, so you can only fit a medium sized dog in it or a smaller dog. It’s a little bit of a letdown to see that this crate doesn’t have as many choices as the other ones on this list do. Still, at just under a hundred dollars this is great for bargain shoppers, who are just looking for an attractive piece of furniture to keep their dog in while they’re cleaning or companies over. The great thing about this crate is that it does look rather stylish. It has an old-timey look to it that will fit into any home that’s going for more rustic design. The latch on the door can also supposedly hold your dog for a lengthy stay if need be. If you’re looking for a crate that gives you a lot of room for decoration and has a little bit different of a design layout, then this will be perfect for your home. Sadly, the negatives for this crate seem to pop up a lot. First off, it was pretty hard to find any information on this model of the crate, and it didn’t even have the weight listed on the official Amazon sellers page. They also have several different models of the crate mentioned in the description, as well as, a black model that I could not find to buy. Consumers also reported that while the crate goes together easily, it’s almost impossible to take the crate apart without breaking it. They say that putting it together is a breeze, but don’t expect to ever downsize it for something like moving. You also are going to have to watch your dog for long periods of time to see if they can break out of the crate. It’s pretty hard to determine the quality of toughness with this crate based on the mixed reviews. Also, it is not stated whether or not this crate has any type of stain protection or has a pull out plastic tray for easy cleaning. This is the first crate on the list that specifies that it can be used for either a dog or a cat. This means that there’s probably a little bit more of a resistance to things like clothes than some of the other crates. This is a huge plus since furniture can easily get scuffed making it supremely unattractive to be out in the open. The price also falls in the middle, with the crate only costing a little bit under $150 on Amazon. This makes it great for somebody who’s looking to buy a furniture crate but doesn’t want to pay for anything outrageous. The style of the crate is attractive and will fit in with almost any home as well. It’s crazy it looks nice and consumer says it’s pretty sturdy. This means that you can go off to work and leave your dog in this crate without worrying about broken pieces of wood littering your living room when you come home. This makes it a great buy for anybody who’s not just looking to make their living look a little more refined. The consumers that have bought this crate, also stated that it wasn’t very heavy to move. This is pretty great to know considering the fact that the company doesn’t give a weightlifting for the crate leaving some of us wondering just how feasible it is to move around easily. The doors also open outward meaning that, you’re not going to hit your dog in the face when you go to take them out of their crate. There are plenty of downsides when it comes to this model. For starters, there’s not really that much information in the Amazon listing, and the company only seems to make the crate for medium sized dogs. This is a huge step down from the other models that give you at least several different sizes to choose from. On top of that, while this crate does seem shorter than the rest, there’s no mention of any type of tray or something to pull out in case your dog has an accident. This could mean that cleaning for this model could be more of a pain then you would want to deal with in the long run, even for the medium set price range. This crate has a very modern feel to it. The design feels like something that could easily mix into any modern home. It doesn’t look like an extremely expensive piece of furniture or an extremely cheap one either. Honestly, it’s somewhere right in the middle and looks attractive while not looking overly done. The price point is also pretty low with it falling under $100. The crate is also very light compared to other models and will be easily carried around for anybody who needs to move their newest piece of furniture. 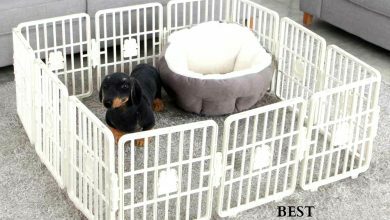 The design also features plenty of ventilation all around the crate so your dog can breathe easy while inside.The crate is described as easily put together, so there will be very little assembly acquire from you. This means that even if you’re not good with tools you won’t have a problem fixing up, this crate keeps your dog in during the day. The company behind this crate has over 40 years of experience making furniture so they know just what they’re doing when it comes to making something that is both sturdy and attractive for your home. A huge plus for me with his crate is the fact that it is actually chewed proof. A lot of other models on this list haven’t been good for long-term use, because the dogs could easily chew through the wood. Casual home takes a step up by making sure that this doesn’t happen with their crate. Also, this crate is a large enough size that it can house something like a poodle. 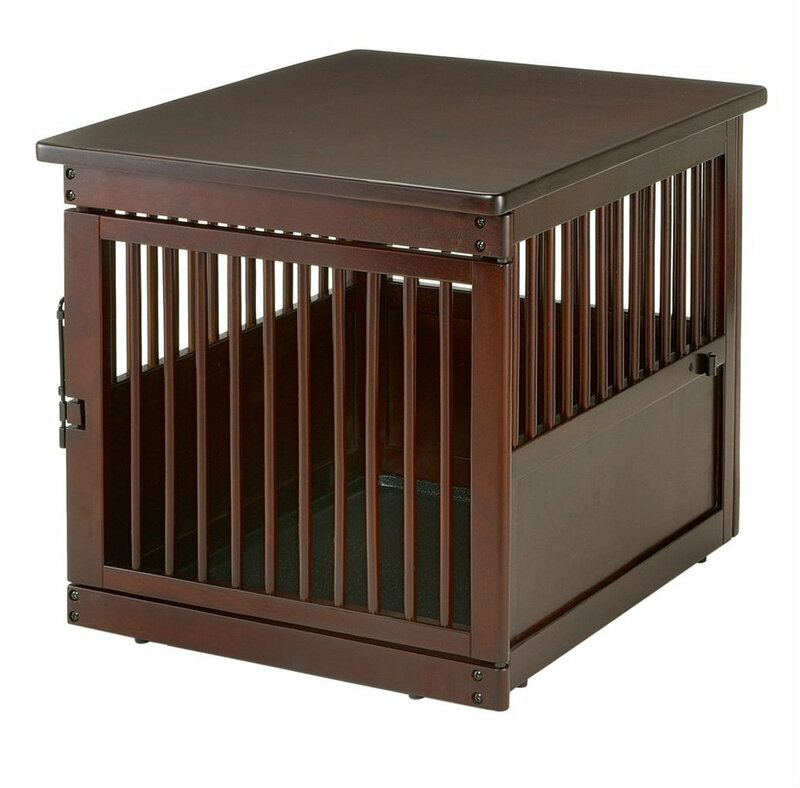 This crate comes in the largest size on this list with it being able to handle up to the 122-pound dog. This can take care of most any pet you can think of with very few exceptions. On top of that, there’s an array of colors to choose from me and you’re not just stuck with the basic brown crate. You can choose from white, black, or espresso to fit in with your living rooms correct decor. There are some downsides to this crate however, some consumers report that the lock can be easily rattled open by your dog. This means that if your dog is smart enough, and they poke the front of the door enough that’s a lock will simply slide open letting them out. Some people also state that the large size of this crate is a little bit smaller than they expected when they got it. They said that their dog doesn’t have enough room to freely move around like they wish they would have. Other people have said that the crate is a little bit hard to be used as an end table in their living room. This model of the crate is more of a combination of a traditional crate with a piece of furniture than any other design on this list. Instead of using wood all the way around, they put in classic metal cage material to keep your dog at bay. This leaves the cage looking a little bit different than a piece of furniture, and kind of creates an interesting look if placed in the right setting. Which also makes this crate a little bit stronger than some of the other entries on our lessons that use metal instead of wood that can be chewed through. This crate is designed from top to bottom to look fabulous in your home even with it being made to be more sturdy. It even has a piece that you can remove on the bottom too easily pull out the tray with. This piece is placed here in order to hide the fact that this is a full-on kennel. This crate it also includes a removable divider they can go in the middle of the crate, two separate small dogs or puppies. This crate has an MDF finish to deter accidents from sinking into the wood. This coating will help your crate stay fresh and keep any odors from sticking around longer than they should. They have a huge price difference depending on what size you need, you are looking between a $50 to $70 price difference depending on what model you choose. 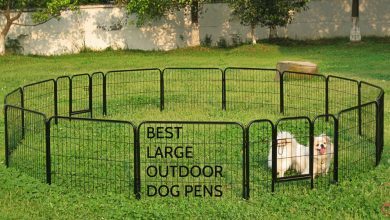 The large version of this cage is pretty great for keeping bigger breeds of dogs in. Still, don’t expect to fit anything like a Mastiff into this cage properly and keep it in one piece. The tray for easy cleaning is included like mentioned above there’s a piece that you can put in to hide the fact that your crate even has a tray in it. It is also super sturdy compared to other products on this list and you do not have to worry about things like scratches or chew marks as much as you would with pure wood models. To make this crate even better the cage is also easily collapsible so you can take it with you on journeys. Now, comes the bad parts of this design. Due to the fact that this crate is easily collapsible, you may have some trouble keeping it all in one piece. While it’s still sturdy you may notice that pieces tend to pop off of it rather easy. This means that you may end up spending some time putting little pieces back on here and there. Some consumers also report that the door isn’t the sturdiest thing ever. Be sure to take extra care when locking the door and make sure that you attach it in well before leaving your dog for the day. This is for sure one of the more expensive models on our list at $250. This model does, however, come with a one-year warranty to protect you if anything goes wrong with it, or your dog years up too fast. It’s pretty great to have some peace of mind with an expensive item like this since it is so easy for them to be defective. This model has found a truly effective way to bring in metal for extra safety or your dog. With the side being made of stainless steel metal this piece of furniture truly looks like it will fit in great with any interior you decide to put it in with. On top of that, this has the most choices of colors out of any other crate on this list making it a wonderful way to accent your living room.This model is also easily assembled meaning that just about anybody can get this and put it together and just a matter of minutes. This model is only recommended for pets that are already crate trained and should not be used for getting your pet in the habit of going to the bathroom outside. This model is actually made to be completely eco-friendly. The material used to make the crate is made out of is actually an extremely recyclable material that is great for the environment. This means if you ever need to discard the crate you will know that it will be easily accepted back into being used for another product. The metal bars also Ensure that if your dog bounces around a lot the wood won’t just pop off, like a lot of other models have a possibly doing. Thanks to this you can securely leave your dog in the crate all day, while you go out shopping or to work. Not only that, but the way they have combined the metal in the wood to look fashionable is completely wonderful. The multiple choices of colors will also make you feel like you don’t have to compromise on the piece fitting in with your living room like you would with some of the other products on this list. The bad part about this model is that they had to explicitly state that it is in fact not chew proof. This is pretty sad going on the fact that it actually has metal bars, and should be a little bit more resistant but ruin the other crates on this list. 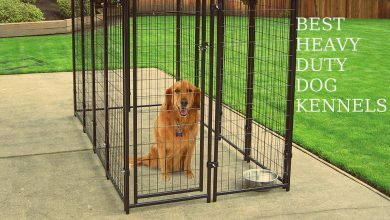 You should also know that the bars aren’t solid metal meaning that if you have an especially heavy dog, they may be able to break out even though the cage is quite durable. When picking a crate to make sure that it is the proper measurements for your pet. If you’re unsure of what your Dog will fit in then, measure them from head to tail and get there weight to see if they can comfortably fit in the crate based on the description. If you have second thoughts about what your dog can fit into, you may not want to buy a crate yet and ask your vet for advice. As with all things, make sure to carefully read the ins-and-outs of each crate to see which one will fit best for your home. Some of them are better for long-term use while the others are just meant to give your dog of stylish place to stay while you’re cleaning.